One of our largest tanks in AQUATOP's Nano category, the ST-500 glass aquarium has a 14-gallon capacity and includes filtration with pump and an advanced lighting system that provides the look of natural daylight. Easy to set up, the ST-500 is a complete, all-in-one system perfect for beginners and advanced hobbyists. The lighting system is energy efficient and includes waterproof switches and convenient feeding lid. From a simple setup to complex planted tanks, this modern Nano tank will accent any room or office. There are many advantages of owning an AQUATOP Nano tank. Our customers include advanced hobbyists who relish the challenge of creating a miniature ecosystem, as well as beginners who love the easy to setup, all-in-one system. 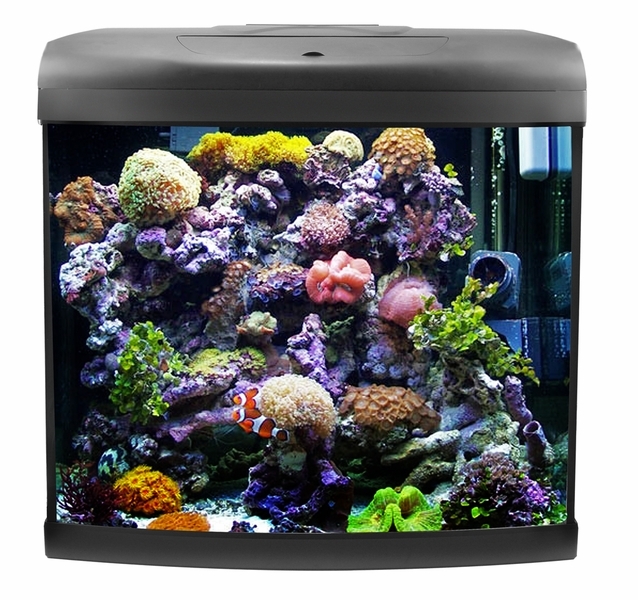 A Nano tank is also a great way to determine if you're ready to invest in a larger aquarium. What are the specs on the lighting for this tank? What type of lighting, what wattage, and what color temperature? Thank you for considering Aquatop! Are the light bulbs proprietary to this tank/company/brand, or are they available at a typical home center? Is there any provision on the back of the hood for the addition of wires or hoses, for heaters or air lines? Does the hood have any provisions for installing a hang on back filter? This might have answered all the above questions. The ST-500 light bulbs are not proprietary to this tank, company or brand. They are standard compact fluorescent bulbs that can be found in a variety of places. The back of the hood has an opening for wires, hoses and airlines to be run through. The hood may accept the HOB filter but it depends on the dimensions of your particular model. Super Deal! Get Them While They Last! Free Shipping!!! Packaged like things made of glass should be and made it safe and sound I was very pleased with that! Best Glass Nano Tank Deal Ever 43.99! You would normally pay as much if not More to ship something like this...at this point you should buy it if you haven't realized that yet! Moms & Dads buying that first tank for the kids this one is totally for you...an unbelievable Deal Here and Free Shipping! Some may think the Under Gravel Filter is a con but they worked for me and my dad for countless years if that matters. Also there are actually two pieces that nearly cover the entire bottom save the bowed front portion...the picture only shows the one. That all said if you disagree about the UGF, it is also built for an HOB filter setup if you want to go that route. They sell those on here as well...just figure out what you want to do see what that entails and then make the best decision for you.